Growing up in the high desert means you really only experience two seasons – hot and windy or cold and windy. Spring and fall like to vacillate between the two, sometimes changing their temperament — and the temperature — in the course of an hour. On this first day of fall, I’m reminded of those bygone days during the change of seasons. The wind is always fierce along the edge of the Mohave, but the gifts of the desert carry their own beauty. Orange, yellow and pink are favorite colors. The desert likes to wear them in the early hours of the morning. Her blossoms blush in the vibrant hues, creating poppies and lupines among the sagebrush and chaparral. The morning that inspired this painting, Sunrise Highway 138, I was driving to work from my brother’s farm. Being a school-teacher, I had created an intimate relationship with the dawn. The sky was alive, reminiscent of the wildfires that rage through the region. Ahead, where it met the railroad tracks, the highway turned at a right angle. A train was slowly crossing the valley floor and the rising sun caught between the steel beams of the chugging cars. For a moment, I was a boy again. The work was fresh and new. A great train stood before me and I was struck by the wonders of our time. For just that moment — those infinitesimally short seconds — I felt a sense of awesome smallness within the universe. That feeling of being small connected me to the beam of light and I was myself and the train and the sun and the earth and all things. Then I blinked and the world was as it always is. 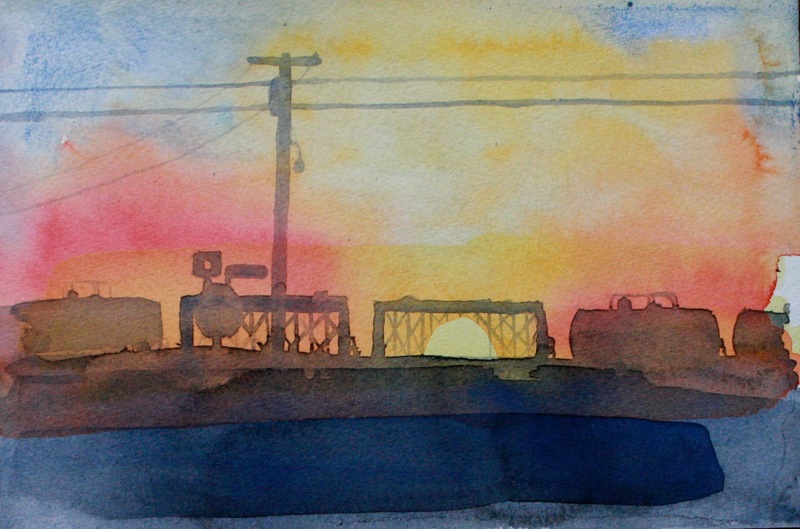 Sunrise Highway 138, is watercolor on 140lb cotton paper, six by nine inches. The original painting normally retails for $145 but is on sale for $75 through Fall 2016. Contact the artist directly at lifeasgood@gmail.com for purchase inquiries. Sale prices include shipping but exclude frames. K Ryan Henisey is a fine artist who lives in West Hollywood, California. His protest works are currently on display at Betti Ono Gallery in Oakland and at the Kellogg Art Gallery at Cal Poly Pomona. An ongoing exhibition of Slumbering Sea is on display at the Newhall Aquarium in Santa Clarita.